Looking for healthy lunch and healthy dinner options for the week? 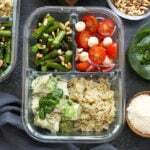 These Chicken Meal Prep Ideas are perfect if you’re looking for a healthy meal that is quick and easy to make. 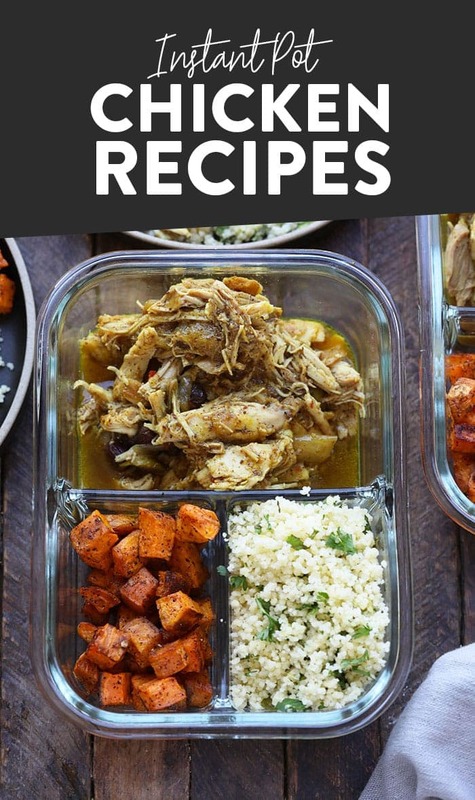 Healthy meal prep is made easy with these chicken recipes that are packed with protein and made with healthy ingredients. Today is the day we talk all about CHICKEN. If you’re a carnivore, you know that chicken is one of the most affordable proteins out there. 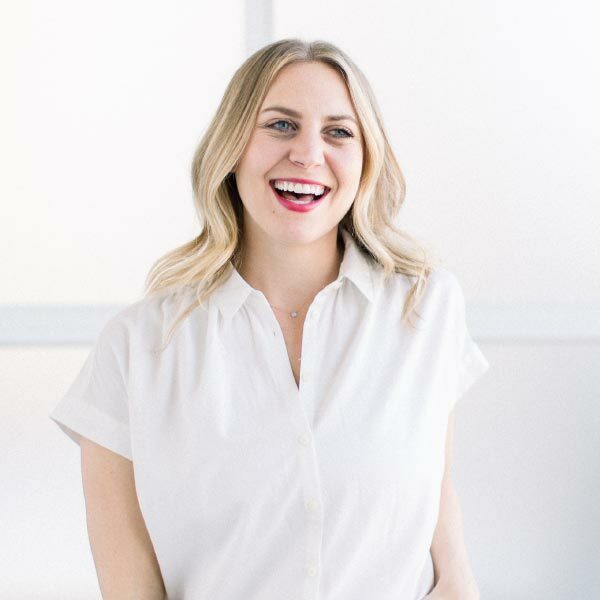 Whether you like chicken breasts, chicken thighs, ground chicken, chicken wings, or a whole chicken, you can generally find reasonably priced (even organic) chicken at most grocery stores. 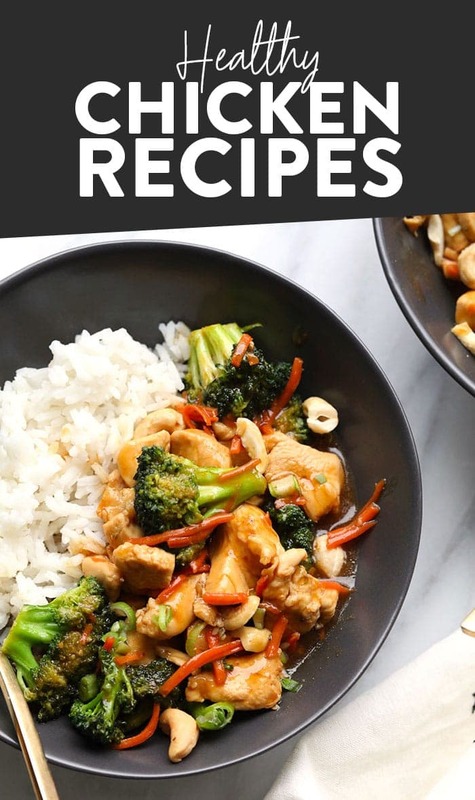 We love healthy chicken recipes on Fit Foodie Finds and we also love healthy meal prep recipes. 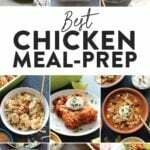 Today we are combining the two and going over our favorite FFF chicken meal prep recipes and what you need to make them. 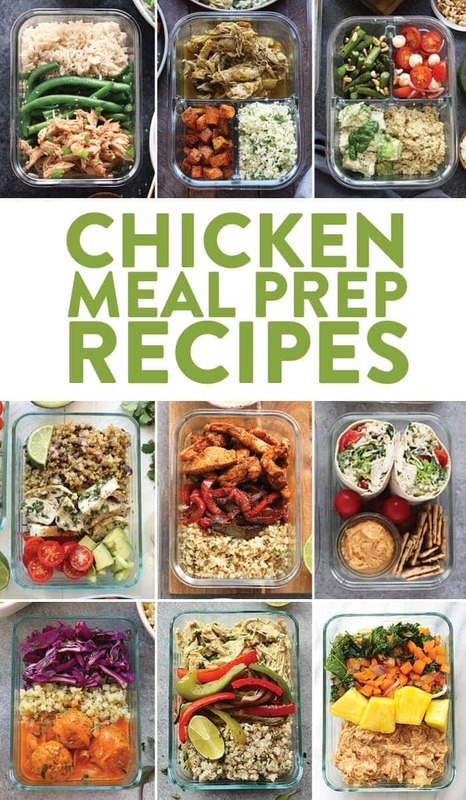 The chicken meal prep ideas in this post are all easy to make, healthy, and usually, include ingredients that are (most likely) already in your pantry. 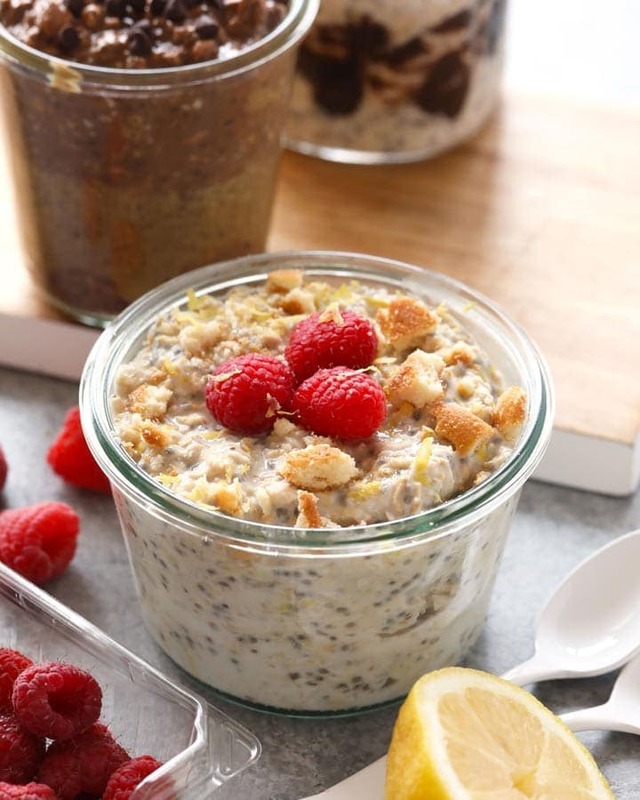 All healthy recipes on Fit Foodie Finds are made with YOU in mind. We try to create healthy recipes that are accessible and easy to meal prep! First things first, let’s chat about the most common questions when it comes to chicken and chicken meal prep! How long does chicken last in the fridge meal prep? Most of chicken meal prep meals will last from 4-5 days in the refrigerator in an airtight container. You can also make most of our chicken meal prep meals as freezer meals. You can store our freezer meals for up to 3 months. 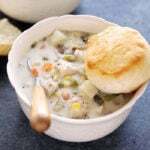 Check out our 6 Crockpot Chicken Freezer Meals for more details. What is the healthiest way to cook chicken? You can prepare chicken in many different ways. In the oven, crockpot, stove top, fried, and more. Typically, frying a chicken breast involves more oil, so if you are looking for a healthy recipe, avoid frying (even though it’s delicious). Any kind of preparation of a chicken breast and how healthy it is depends on what you use to flavor your chicken. When you are deciding how to season or flavor your chicken make sure you check the sugar content or sodium content in your sauce or spice mix. What should I serve with chicken breast? Your options are endless when it comes to what to serve with your chicken breast. We love serving chicken breast with healthy salad recipes like our Grilled Kale and Watermelon Salad or this Massaged Kale and Fennel Salad with Lemon Vinegarette. We also love serving a healthy chicken breast with our Quinoa Tabouli or our Thai Chili Corn Salad. You just can’t go wrong with any of our healthy side dishes. 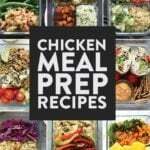 How do I make chicken meal prep easier? We have many tips and tricks when it comes to chicken meal prep! Below is a list of kitchen essentials that we think make chicken meal prep a breeze. Having tools to meal prep really does make all the difference. When we are in a pinch we love throwing a chicken breast in the slow cooker or on a pan with our favorite spices. 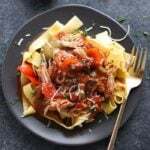 Check out How to Cook Chicken in a Slow Cooker or Instant Pot Chicken Breast for some easy recipes that you can make your own. 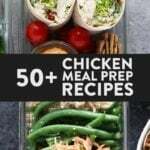 If you’re looking for a full chicken meal prep meal, go ahead and check them out below! These chicken meal prep kitchen essentials are tools and ingredients that will make chicken meal prep easier for you! Whether you want to cook your chicken in the Instant Pot, Slow Cooker, or the Sous Vide, it is nice to have it all on hand! 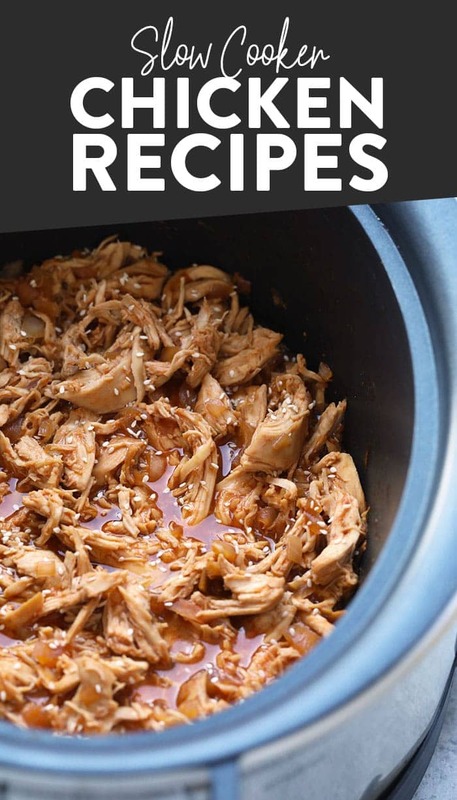 These slow cooker chicken recipes are perfect for meal prep during the week! You have options for full chicken breast recipes, shredded chicken, or you can make a healthy chicken soup in your crock pot! The options are endless. Making chicken in the Instant Pot is perfect for a quick weeknight dinner option. You can cook chicken breast in the Instant Pot and add your favorite sauce! 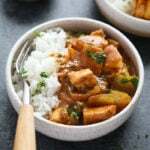 Healthy chicken recipes in the Instant Pot make meals fun and easy! Throw all of your ingredients into a casserole and you have lunch and dinner meal-prepped or the week! 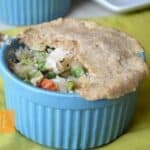 These healthy chicken casserole recipes have a combination of vegetables, grains, and sauces. Make one for meal-prep this week! 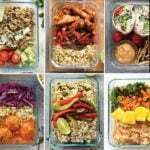 These healthy chicken meal prep recipes are healthy and easy to make! 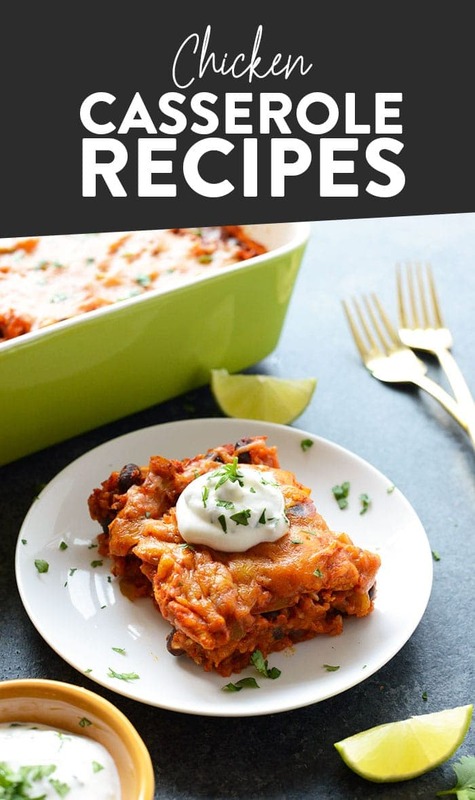 There are low carb dinner options, one-pan dinners, healthy quinoa chili recipes, and many healthy bowl recipes for you to choose from. Every recipe is a healthy meal-prep recipe that the family will love! Place chicken on an oiled baking sheet, drizzle with olive oil, season with salt and pepper, and put in the oven and bake for 25-30 minutes. Place chicken breast, olive oil, and salt and pepper inside of your slow cooker. Cover slow cooker. Cook on low for 6-8 hours or high for 2-3 hours. Place olive oil on the bottom of your Instant Pot and turn Instant Pot to the saute setting. Season chicken breast with salt and pepper and then saute for 1 minute on each side*. Close Instant Pot and make sure the pressure gauge is turned to ‘seal’. Set pressure to manual, high pressure and set the timer for 8 minutes. Pressure will build and then the timer will start. When the timer goes off, quick release the Instant Pot by turning pressure gauge to ‘vent’. 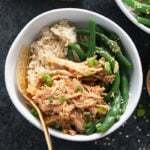 When pressure releases remove chicken breast from Instant Pot and prepare chicken any way you please (diced, shredded, or etc.). First, season chicken breast with salt and pepper and then heat olive oil in a skillet on medium heat. When olive oil is fragrant, place chicken breast in the skillet and cook each side for 6-7 minutes or until the internal temperature reaches 165ºF. Option to use whatever seasonings you like on chicken breast.